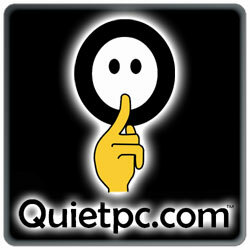 It's not just any badge, it's a Quiet PC badge! Why not tell the world you have a quiet PC, with a Quiet PC case badge! The case badge Is a nice design and fits well. However one of mine malfunctioned as I was trying to install it part of the sticky side came off with the part you peel away to reveal the sticky side, I had to fix the fault using clear sellotape. Need to be careful and make sure you only removing the cover and the sticky side doesn't get removed with it. very nice design and good quality. i should have expected it to be better than expected! I was thinking when I got this that 60p is a lot for a little sticker, but this is in fact one of those 3D glassy ones that are quite thick. Makes my metal Gigabyte one look a bit cheap by comparison. I didn't bother putting quiet fans in my PC, this sticker did it all for me and saved me a bunch o' cash! Seriously though, quality well made very sticky sticker worthwhile bunging on to show you made an effort in cooling your PC. Thought it is only a small badge, it looks great on my desktop case. My daughter loves this too.